Mojitos line the bar at Havana's well-known La Bodeguita del Medio. Photo courtesy of Libby McMillan Henson. Photo courtesy of D.J. Henson. 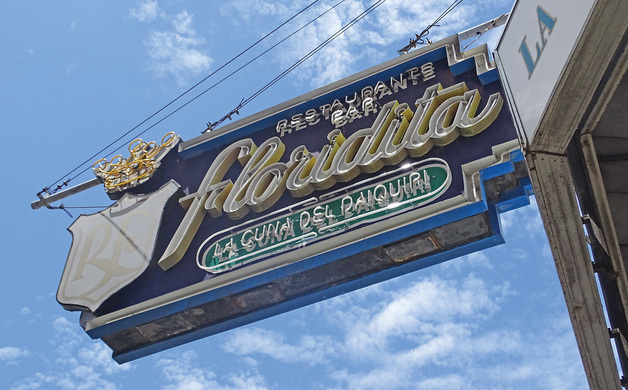 El Floridita, located in Havana's older section, is one of the city's historic culinary delights. Photo courtesy of D.J. Henson. Cuban-born chef Gloria M. Jordan is beloved in Southwest Florida for her two restaurants and her bubbly personality. Jordan’s adorable way with words, zany sense of humor, zest for life and seemingly unlimited energy are all part of her recipe for success. Delicious food doesn’t hurt her popularity, either. Now, however, she has an additional passion. When this saucy force of nature began leading small tour groups to her native Havana in early 2016, it was a dream come true for those of us who had longed to see Cuba, but were either intimidated by logistics or longing for an insider’s perspective. Flash forward to the end of 2017, and Fort Myers’s irresistible chef-turned-guide has introduced untold visitors to her beloved Cuba. While her La Trattoria Café Napoli and farm-to-table Mermaid Garden Café crank along during her short absences, Jordan energetically reveals the vibrancy of her country of origin to adventurous groups from Southwest Florida. 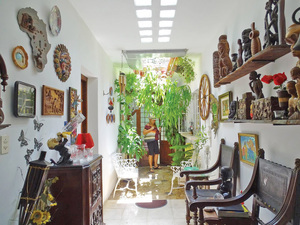 Her intense four-day excursions go beyond mere tourism; Jordan is on a mission to introduce visitors to the broad spectrum of makers and hospitality providers in Habana. She carefully curates an ever-growing list of talented chefs and privately owned restaurants, artists and studios, and owners of rental homes and driving services. 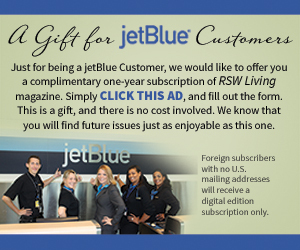 Pre-departure information is thin, by most standards. But those in Jordan’s capable hands discover in time that what initially appear to be fairly spontaneous experiences have been deftly orchestrated from a master list, around weather, hunger, energy levels and unexpected needs and desires. After growing up in Cuba, Jordan left Havana in 1992 to pursue a culinary education in Stockholm. Upon graduating from Umea University School of Restaurant and Culinary Arts, she moved to Spain, spending the next four years honing her culinary skills. Mediterranean cuisine is the inspiration for the menu at Jordan’s trattoria. Opened in 2005 and expanded in 2009, this popular lunch and dinner hub near Bell Tower Shops is where many tour group members first come to know their future guide. 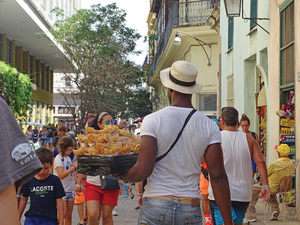 “Cuba is different,” explains this dynamo chef-turned-guide. “It takes you back to the past, and it’s mystical. The rotating list of privately owned restaurants Chef Gloria includes in her carefully curated itinerary all has absolutely smashing food. In these under-the-radar paladares, diners are consistently delighted with fresh, innovative cuisine―snapper carpaccio, tantalizing ceviches, slow-roasted pork with aromatic rice, mango and avocado salad―and often in beautifully designed spaces. Proprietors know their regular patron is also a chef, and work hard to assure her guests are pleased. Havana’s cocktail scene is one of its more pronounced throwbacks to the ’50s. Rum is the standard, of course, and flows freely. Freshly made mojitos have never tasted better, and a frozen daiquiri (pronounced DIE-kuh-ree in Havana) is a must. Nighttime entertainment spans the gamut from retro lounges with talented Ricky Ricardo-style bands, to the hippest of dance clubs. Floor shows like the Tropicana’s iconic extravaganza happily pile on the time-warp vibe, but Havana does have a few uber-modern nightclubs as well. Being in Havana is a rich, personal experience that many guests continue to process long after returning home. 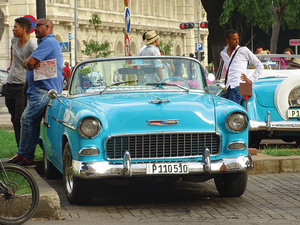 More of an expedition than a vacation, the trip presents what you expect: the magnificent cars, the iconic Malecón, feathered dancers, fabulous live Afro-Cuban music, eye-popping architecture and mojitos galore. But there’s also a lot you don’t expect: the gracious people; the magnificent food which Jordan makes possible; the level of disintegration in once-beautiful neighborhoods; and the many clever and talented entrepreneurs who’ve found a way to eke out a living via tourism. Admittedly, Havana has more challenges than typical travel articles reference, but having been there, one understands the temptation to leave negatives out of the conversation. So many talented locals have hope for their Havana and their own future, you can’t help but cheer them on. The minor inconveniences one experiences are not what’re remembered. Memories consist, instead, of Chef Gloria’s hilarious microphone monologues in the 10-passenger van; drinking rum from a coconut on the beach; and having a life-changing adventure with your buddies. Written by author Libby McMillan Henson, who traveled to Havana with her husband and friends on a Gloria-led expedition this past July.